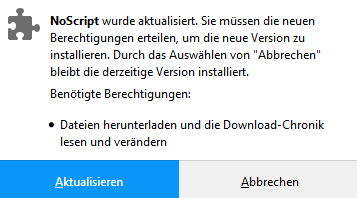 I was just wondering if it's normal to give the new noscript access to all these things it's asking for on installation - I guess they were things which it had anyway before webextensions changed the system but I just wanted to check to make sure I'm downloading the right thing. Sorry for the silly question, I can see why it would need access to these things butI've never seen them with a firefox installation before (guess it's the new system) and it's worded a bit ominous. Last edited by Arkonor on Tue Nov 21, 2017 6:24 pm, edited 1 time in total. NoScript needs to inject content scripts inside each page to create placeholder for replaced elements. Once a script run inside a page, can access all its data. NoScript needs it to tighten them. Same as above, in order to decide what to block it needs to know which site is navigated. This is for webRequest, the main API allowing NoScript to analyze load attempts and block the unwanted ones. Guest wrote: Sorry for the silly question, I can see why it would need access to these things butI've never seen them with a firefox installation before (guess it's the new system) and it's worded a bit ominous. Thanks a lot for all your good work making our browsing experience safer and giving us the power to choose to avoid unwanted content. Please explain why NoScript needs those additional rights. But still, with all respect, you shouldn't be able too. Couldn't tell that from the way Firefox asks for these permissions. Sounded quite suspicious, at least in German.